Students are divided into classes of mixed ability in 1st year and taught a common syllabus. Classes are separated into higher level and ordinary level from the start of 2nd year. Four different modules are taught during Transition year. All students sit the Junior Certificate and Leaving Certificate mathematics exams. Junior classes have 5 maths periods a week and senior classes have 6 periods a week. All first years sit the Irish Junior Maths competition in March. All second years and some first years sit the American Maths Competition (AMC 8) in November. There is a maths club for first years which meets once a week. Senior students participate in the IMTA school maths quiz and were All Ireland champions in recent years. 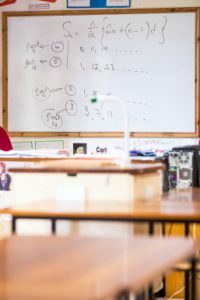 There is a very strong, hard working maths department within the school with many teachers contributing to talks/seminars for the IMTA (teaching the teachers). A number of staff were also involved with writing the best selling ‘Active Maths’ series of textbooks for the new project maths curriculum. Professional development is ongoing with staff members currently enrolled in Masters qualifications and undertaking MOOC (online) courses.